This section covers the line where it runs parallel to Abbey Lane, from Beaumont Leys Lane southwards to the North Viaduct. The northern part runs through housing estates, whereas the southern part is encroached upon by various industrial units. The truncated abutments are all that remain of the brick bridge over Beaumont Leys Lane, here looking south east towards Abbey Lane. The rocket tower of the National Space Centre is poking above the roofs in the centre of the photograph. 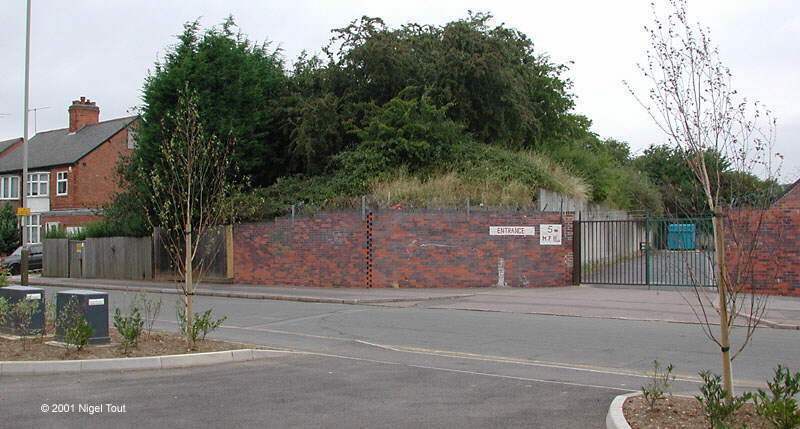 Less than half a mile south of Beaumont Leys Lane you arrive at the first structure built across the track bed. 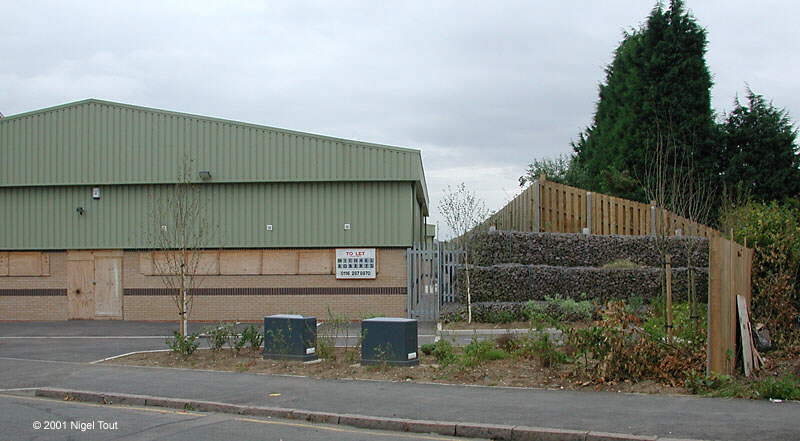 This is an industrial unit on Menzies Road (which can be reached via a footpath at the end of Byford Road), looking northwards. The track bed is under the right side of the building, parallel to the hedge. Abbey Lane Sidings and coal depot were to the right of the photographer on the east of the line. Turning around, the trackbed headed south here and is now covered by Menzies Road. The remains of the northern brick abutment which supported the steel bridge across Blackbird Road. 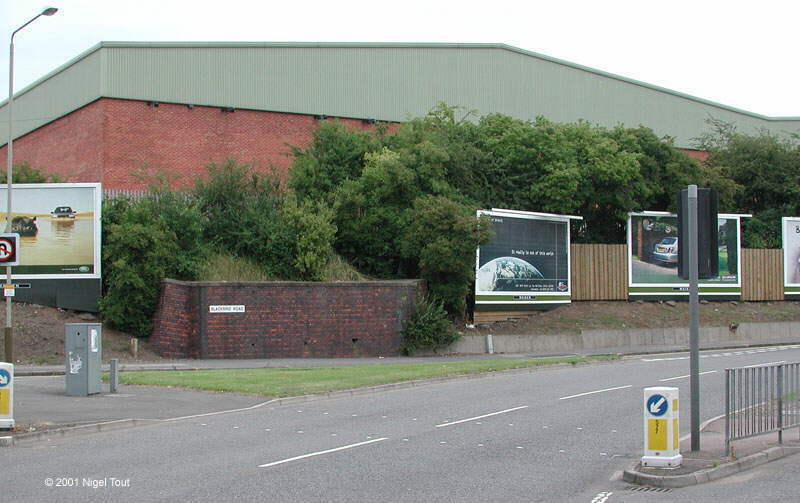 Viewed from the junction with Parker Drive, looking northwards at the other side of the factory shown in the above photograph. The view across Blackbird road, looking south, taken from alongside the bridge abutment in the photograph above. The embankment carrying the track headed across the lawn at the back of the flats, and probably went through the left hand corner of the nearer block. About a hundred yards south of Blackbird Road the GCR crossed Devonshire Road on a brick bridge. Looking northwards you can see the remains of the embankment, but all traces of the bridge have gone. Having crossed Devonshire Road and turned round to look south, you can see that even the embankment has been removed. Though ironically this has had to be replaced by stacked stone and a fence to shield the houses on the right from the new industrial units and stores built on the track bed. The other side of the factory unit pictured above across the track bed, again showing the stacked stone wall and the fence to shield the houses. There is a second factory unit immediately to the left.